For the first time ever, I will be hosting my family during the holidays. I am so excited and want to fill the apartment with festive cheer: cookies, eggnog, stockings, and all the little things that make Christmas feel special. In anticipation of their arrival I even bought a real tree (which was no small feat; getting 6 feet of Nova Scotian Balsam fir on a very crowded bus was truly a Christmas miracle!) 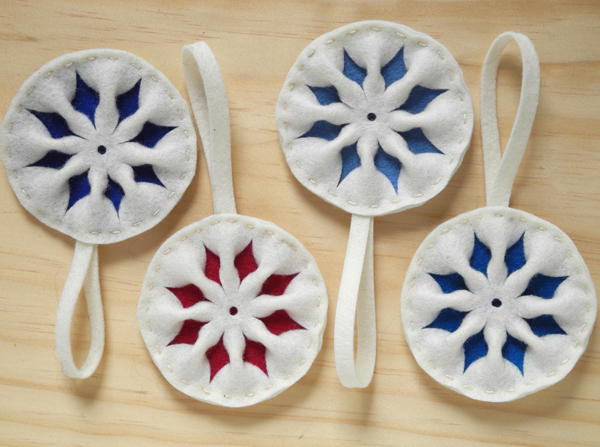 and made some felt ornaments for it. The ornaments were simple to make and the perfect way to spend an afternoon with a mug of warm cider. 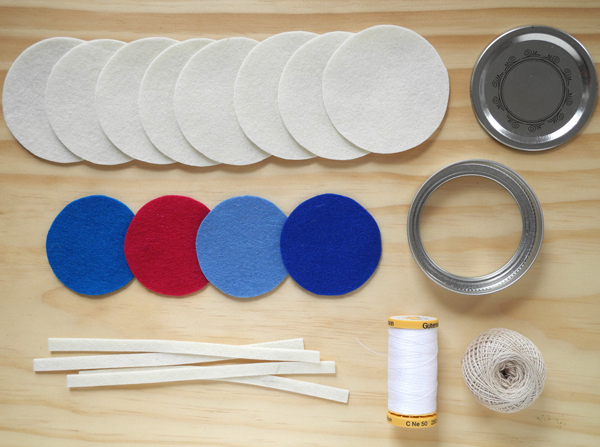 Materials you will need: ivory felt, coloured felt, circle templates (I used the 2 parts of a jar lid), sewing needle and thread, embroidery thread, hole punch, scissors, and a disappearing ink pen. 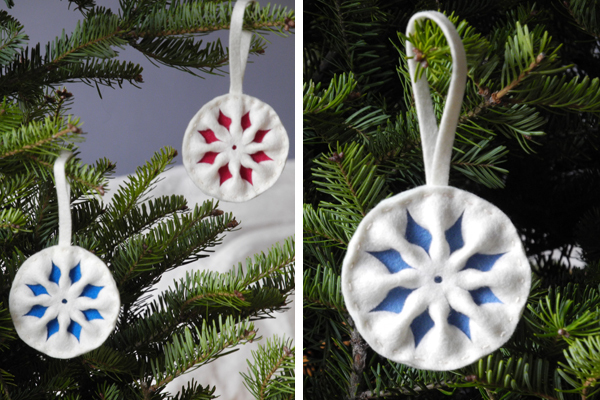 Step 1: For each ornament you will need 2 ivory circles, 1 smaller coloured circle, and a ¼”x 6” ivory strip. Step 2: Draw a star on the ornament front. Step 3: Punch out the center. Step 4: Cut the radial arms of the star, making sure not to cut all the way to the edge or centre. Step 5: Pinch the centre of each wedge and secure with sewing thread. 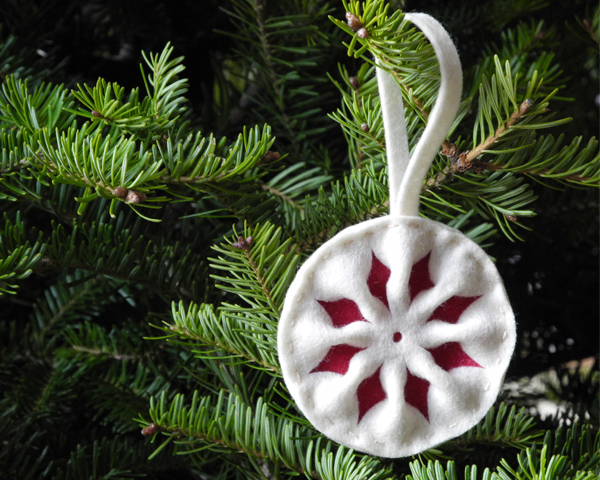 Step 6: Stack the layers together – ivory circle, coloured circle, hanging loop, and ornament front – and sew closed with the embroidery thread. I plan to embroider initials or the year on the backs, and give them away as parting gifts. Maybe it will even start a new tradition, with a different ornament commemorating each year. hi steph! it looks like you posted this NEW post on your OLD blog RSS feed! I just wanted to let you know! i only happened to notice because i kept your old feed in an archived folder in my Google Reader for all the stuff i had starred from there. now i noticed a new post in this old feed, but it didn’t show up in your NEW feed… not yet, anyway. merry early christmas! just kidding. i spoke too soon. any ideas for saving my starred items in Google Reader to your new feed? i don’t want to lose the starred posts from your blog! Cute! These remind me of Christmas cookies! My son is in French class, and we are making French Christmas cookies this afternoon (for extra credit–helpful)! Bought some felt the other day to make tree decorations, then wasn’t quite sure what to do with it… you may have solved my problem! These are truly darling. Thanks for sharing! This is such a great tutorial! Thanks for the inspiration! These are so sweet! And I agree with Judy. They do have a “cookie” look to them. I love these! They are so cute! Happy sewing! you are so talented and creative jordan! did you think this design up on your own? you are amazing! no! My contributor Steph Hung did! Click on her byline at the top. Her work is beautiful! Love these. I’m adding this to my weekend “to-do” list. So cute. i’m thinkin i’m due to make some homemade ornaments for friends! OMG I am so wishing we were family right now so I could be going to Paris for Christmas. How fun. These ornaments are fabulous. Once again, thanks for the inspiration. Good luck with the family! With those ornaments, you’ll win them over! Oh my goodness this is absolutely adorable. What a sweet little ornament to hang on the tree. These are beautiful- sure to become an heirloom. Those are so pretty and such a simple idea. Thank you very much for sharing. I just made two of them as well! I wish I had started earlier in the season. Now I feel obsessed with making at least a dozen before the big day! Love them! And I feel so crafty without actually being crafty … which, I guess, is kinda the definition of being crafty. These look sweet! One question, though: Any reason not to do the decoration on both sides? I love these ornaments – so, so beautiful! These ornaments are adorable. Thank you so much for sharing. These will look great on my eclectic tree. I have been making felted Christmas decorations this year, classic ones like stars or angels in red and green with lots of old buttons stitched on! But this one is so original! I will definitely try it! @BrendaLynn – I don’t see any reason not to do the decoration on both sides! Double the work, but double the cute. I think I’ll try that kind next. These are very special. How I wish you could have posted pics of hauling the tree home. Have a wonderful time celebrating.